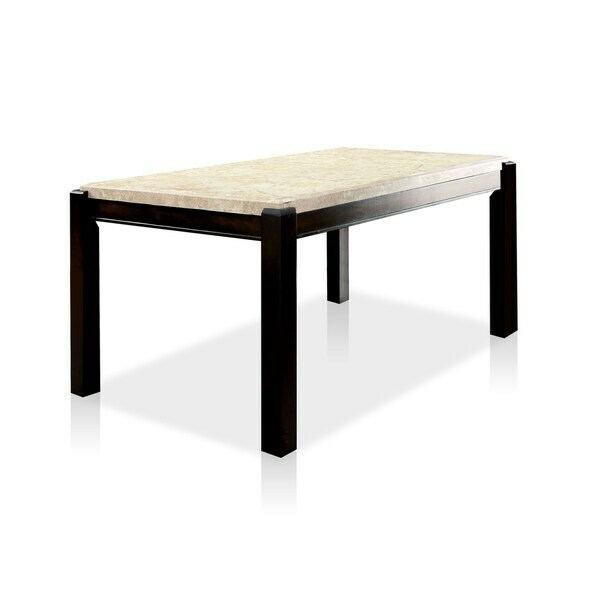 Raise the bar in your home decor appeal with the help of the Joreth Marble Dining Table. The beautiful genuine marble top is sturdily upheld by the dark walnut frame, and features stylish corner brackets to add a fun twist. Dimensions 64.0 In. X 38.0 In. X 30.25 In. This dining table gave me the look I wanted for my dining room - something strong, reasonably formal without being ostentatious. It is also a reasonable size is adequate enough to seat 6 people. Assembly was a challenge by myself, only due to weight. Smarter to have someone help you when you turn it upright. There was also a scratch on one of the legs from shipping - that was a disappointment, but, will fix using some dark wood stain. A reasonable value for the money. This table has been a great purchase for my family. There are 6 of us, so eating, crafting, playing games, socializing, entertaining and work all happen at this table. The colors are beautiful. It is a very heavy and sturdy table. I paired it with chairs from my favorite local furniture store, and I'm so glad we bought this Joreth Genuine marble table. GREAT TABLE. We love the marble top and its authentic marble and looks and feels great. Its heavy so make sure you have some help to get this table set up. Beautiful table, but stain so easily. Even after proper marble top treatment, water marks and stain formed so easily. It was a disappointment. I love this marble table. I purchased it 2 years ago and has looked beautiful in 3 dining rooms already. It is very heavy so doesn't shift around and makes dining room look very classy. I purchased similar chairs to those pictured and I couldn't be happier with the look. I've had this table for less than a year and the leg is splitting down the middle. Amazingly beautiful. Extremely heavy. But well worth it and a great conversation piece. It was a very sturdy and heavyset table..the chairs were a little low when you sit but nice. "Is this a tab marble or grey ? It's hard to tell from picture"
it's like a light tan. "Do these chairs come with the table "
"Can this table come in countertop height??" "just got this table... looks fantastic... great quality! My question is... " has this marble already been sealed at the factory?" ... thank you for any info!!" Hello jeff, congratulations on your new purchase. The top has been sealed at the factory. Thanks for shopping with us! The marble top is appealing for long lasting wear and tear. I've been looking for a granite table for awhile but most of them came in 60 in and this one is slightly larger, enough to make a difference. "How much does the marble top weight and how much does the table minus the marble top weight?" Hello texaswinelady, the marble top weighs approximately 156 pounds. Have a great day! "Is the marble top soft and porous (can be nicked and absorb stains), or is it a hard, durable finish that resists nicks and stains like you might find on a marble kitchen counter?" Hello lakegirl215, we can appreciate the fact you want a firsthand account of the product. You will receive an email notification every time you get a response. Thank you for shopping with us.